When Harry said that Steve Botkin had the idea of holding his next Slap Yo’ Daddy backyarder in downtown Anaheim, I thought they were both crazy. Who does that? A backyarder is supposed to be novice cooks smoking in somebody’s backyard, not on a big city street with a beer garden, palm trees and swanky store fronts. I should have known well enough to never under-estimate Harry’s ambition in life. 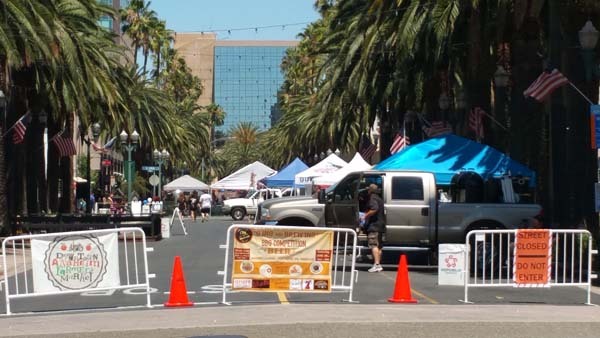 Six months later, here we were: 23 backyard (non-professional) teams competing in a one day, three meat contest in downtown Anaheim. 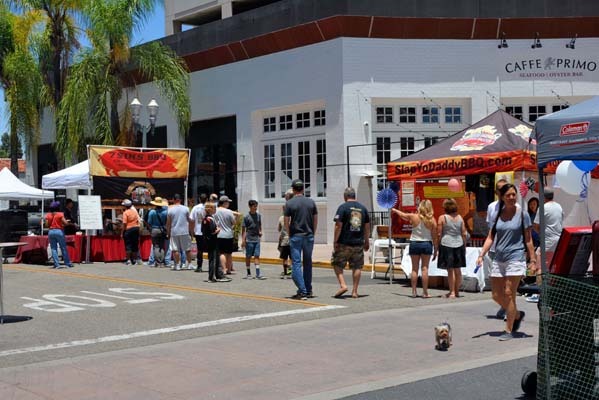 Alongside, were 24 certified judges, 3 check-in coordinators, six mentors, a dozen volunteers, sponsors, two caterers serving BBQ to the public, a stage, two live bands and yes, a beer garden and 6 local breweries. The only thing we were missing was the Hooter girls: maybe next year. With one contest under our belts and the help of seasoned contest organizer, Ben Lobenstein, we jumped right in. 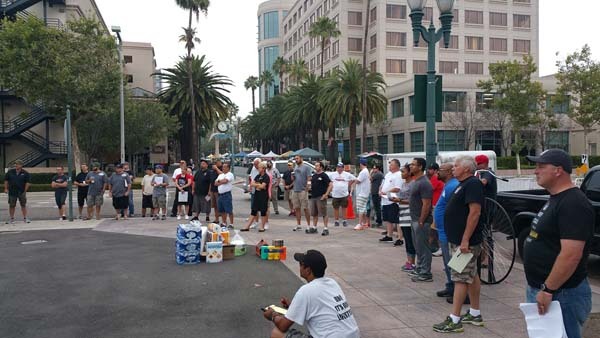 Teams began showing up the night before and by 5am, the trucks and trailers rolled in. Two and a half hours later, teams were in their spots and I had checked all of their meats, fire extinguishers and performed a safety check. It’d be another hour before I could hand out all of the Styrofoam boxes for their meat entries. Volunteers brought in their 10×10 canopy tents so we didn’t have to rent an expensive judges tent. 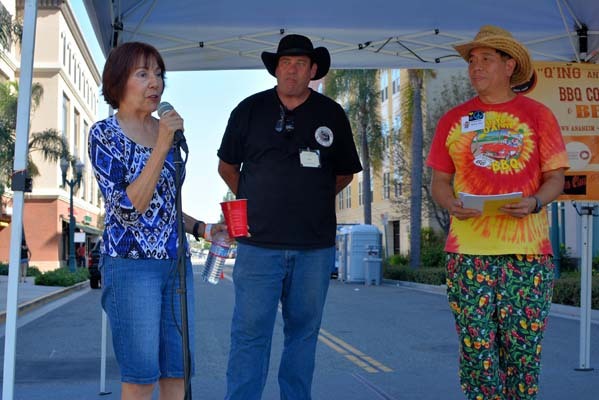 And we were particularly grateful to the judges who came to judge out unsanctioned contest. There was no signature to be counted towards earning a master judge status. At 7am, Ben Lobenstein welcomed cooks on the speaker system Harry just bought at Sam’s Club and answered any questions from the field. SYD backyard alumn, Tom Gruenbeck, brought over the rented tables and chairs, for which we were very grateful. 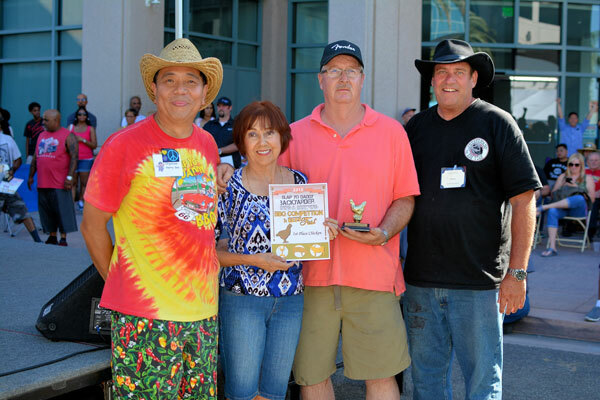 Steve Botkin of Desperado BBQ, last year’s Grand Champion, contributed more to this event in hours than almost anyone else. He met with city organizers, rental agencies, the Anaheim Halloween Parade group, the fire department, social media groups, our caterers, you name, and he did it. 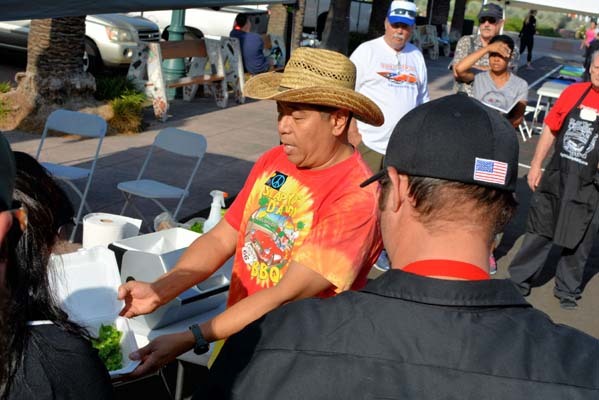 All of that energy stemmed from his love of the BBQ community. Steve was easily the BBQ love poster child MVP for the day. At 10am, we welcomed our judges, many whom judged the first year. By the time the first entries had arrived, the turn-in coordinators were directing teams to one of four judging tables. 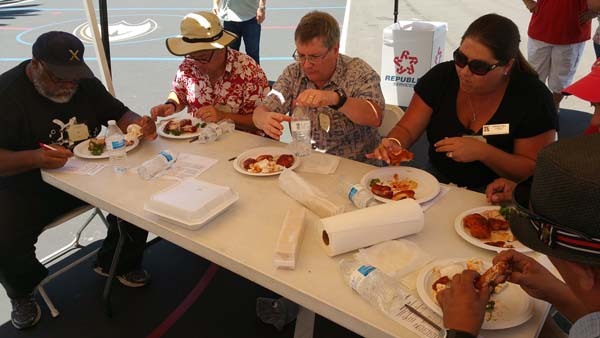 Each team would go to a different table for each meat cooked to even out the judging. 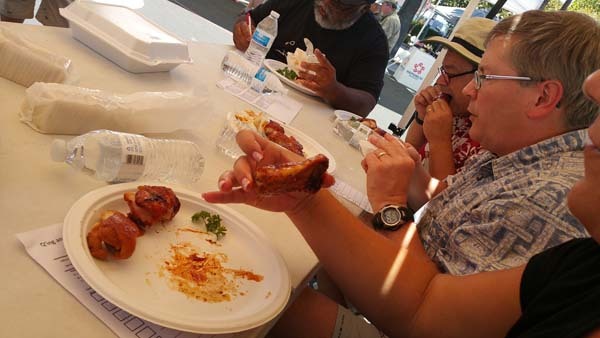 Judges would score the entry presented to them and then talk to the cook about the meat. 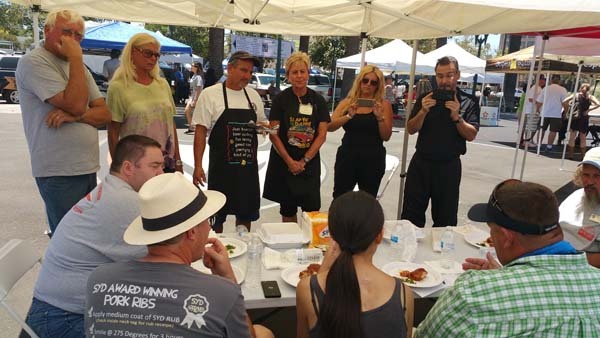 We asked teams to include 7 pieces so cooks could taste the entry alongside the judges. This ensured that the cooks understood what the judges were talking about, in case they didn’t try their entry or didn’t know what it tasted like by the time it was judged. Each team had a 10min window given to them to be judged, though we asked that the time be kept to 7min. No one was turned away for late entries or was disqualified. This was a learning experience for cooks. If something illegal was spotted, it was mentioned for future reference. 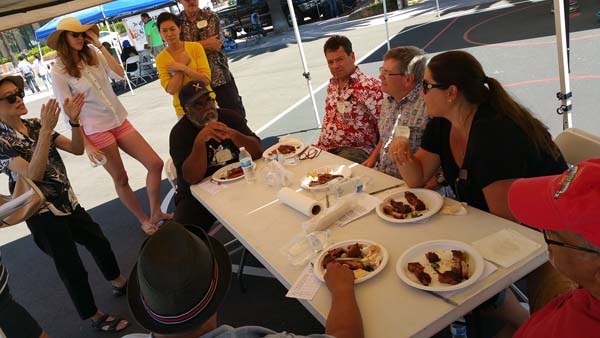 Judges (many of whom were experienced cooks or last year’s backyard cooks) shared their opinions with our backyard cooks and everyone learned from each other. It was truly an honor to have some of the biggest names on the west coast with us at this event. Many have been cooking for decades. And there were at least 1-2 master judges at each table. Teams attended Harry’s box making class, listened to Harry’s advice, and were very excited to be there. Cooks were well prepared, brought their equipment and meats and had practiced. 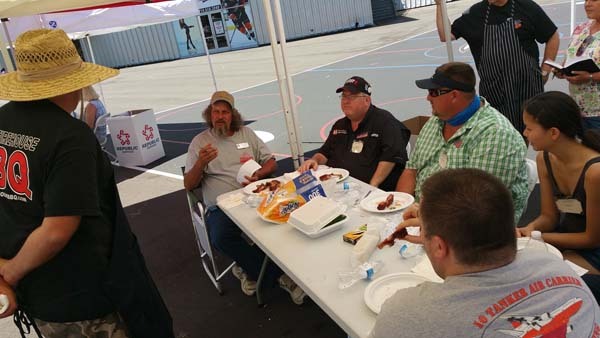 Several seasoned pitmasters were also present to provide mentoring. I was delighted to see a variety of smokers (pellet cookers, drums and WSMs), in addition to my favorite one, the 14.5” WSM. One team forgot to bring a table so we lent them a table. Others were ready to entertain their friends and family who were coming later. In the igloos were also some deviled eggs, sausages and buns. Our cooks had brothers, sisters and children with them to help. It was a family friendly event. The turn-in coordinators, Teree Rola, Debara Traver and September Krafcisin, did an absolutely fantastic job of directing the arriving teams to their table and asking the judges if they needed anything. They made the judging flow smoothly. Leftover BBQ in the box was picked up by former student, Daniel Hom and distributed to volunteers. I tasted a few entries and knew our students were cooking very well. Many teams expressed how helpful their judges’ insights were to them. As I was scoring, I could hear our two volunteer bands play in the distance, near the beer garden. The crosswalk to the teams was crowded. 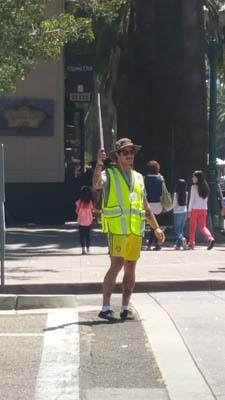 I was glad our volunteers who manned the crosswalk had a wide brimmed hat because it was getting pretty hot by 1pm. 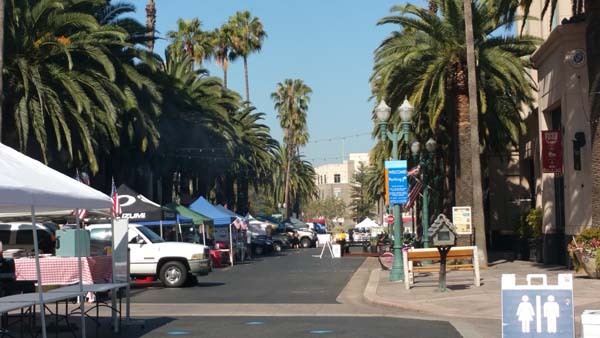 Luckily, the tall buildings and palm trees which lined West Promenade Street provided a good amount of shade for our teams. 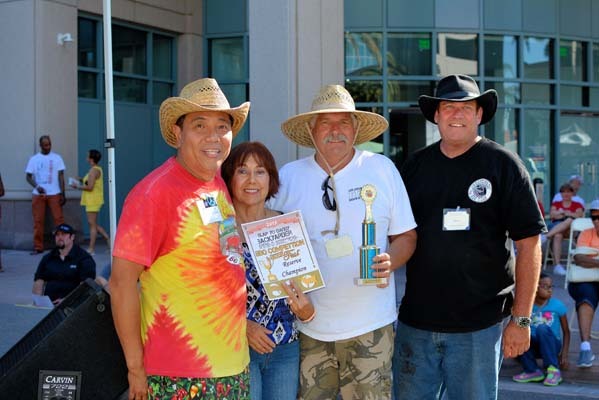 In the judging area, the breeze brought smiles as we shifted our tables and chairs into the shade of the tent. 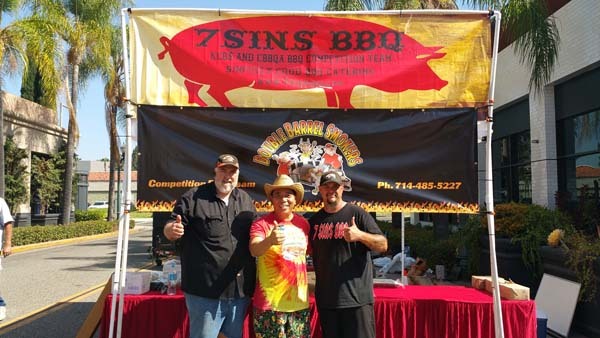 Our public tasting depended on our two caterers, Roger Cason of Double Barrel Smokers from Anaheim and Jesse Collette of 7 Sins BBQ from Temple City. 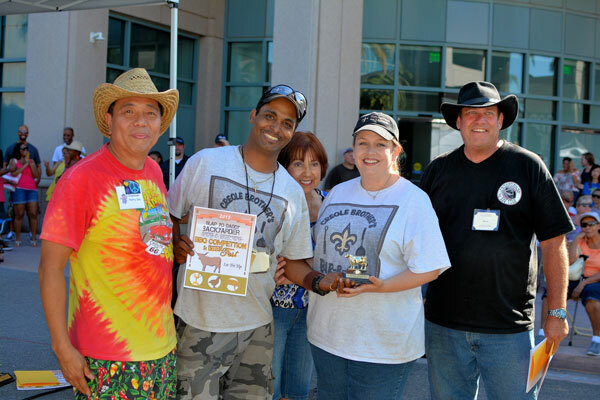 These two groups smoked BBQ all day using Harry’s championship rubs and Steve’s award winning sauces. They served over 1,500 samples to our visiting public and did a great job. 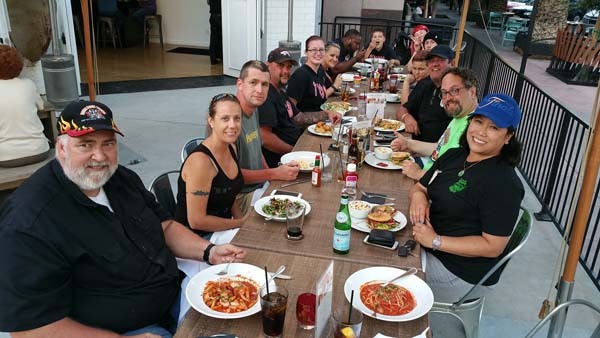 We are eternally grateful for their efforts and the work that they and their teams provided for this event. Three and a half hours later, the judging was done and I was almost done scoring. Volunteers pulled the tents down quickly and put away the chairs and those that needed to, rushed to their next event for the day. One person had a birthday party to attend. Another had a wake before I die celebration. My heart was filled with gratitude for those who came and gave of their time and compassion. I know how precious those few hours can be on the weekends. By 4:30pm, Ben, Harry, Steve, the pro-tem mayor, the trophies and the results had arrived on stage. Teams brought their chairs, or dragged the ones from the beer garden over to the right of stage where the shade was located and rested. I took over Ben’s fancy camera and took photos of the winners as they walked up. There wasn’t any prize money to be handed out. It was just pride at this point. In the end, I knew what was most important was not how well each team had done but how much each of them learned in the process. Harry printed out certificates for the top 10 entries in each meat category and then handed trophies out to the first place winner for each meat. 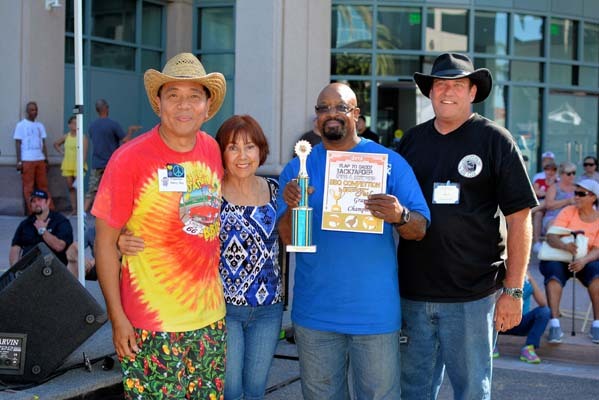 One of the highlights of the awards ceremony was Shaun Guyot of Creole Brothers BBQ, who took first in tri-tip. When Ben announced his name, Shaun’s fist and entire body pumped towards the sky in victory and he shouted like he had just won the U.S. Open and the 1.8 million dollars that goes with it. 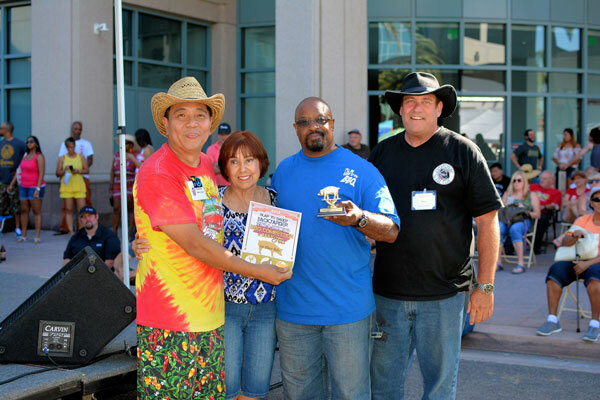 Brad Fiske of Hot Stuff BBQ took first in chicken and then Royce Armstrong of I’ll be good to you BBQ took first in Ribs. There were a number of ties between the teams and we broke the ties with the team that scored higher in taste. If there was still a tie in taste, then the team’s texture score would break the tie. It was fun watching students who had taken Harry’s class experience the joy of having their names called to the stage. Many of them I had met years or months ago. It felt like we were watching the fruit of our labor as much as theirs coming to life. 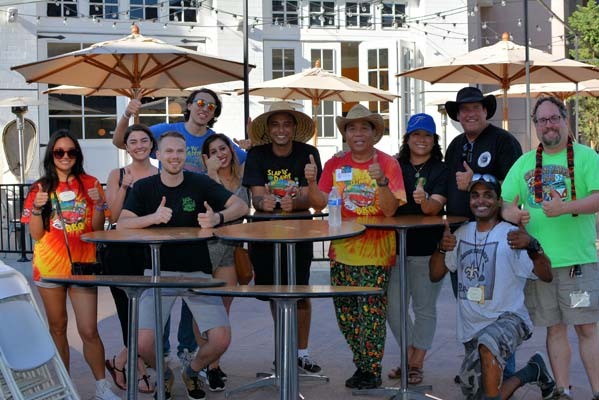 We would like to congratulate all the teams who participated in the Q’ing & Brew’ing BBQ Competition and BeerFest and hope that they had as good of a time as we did putting it on. 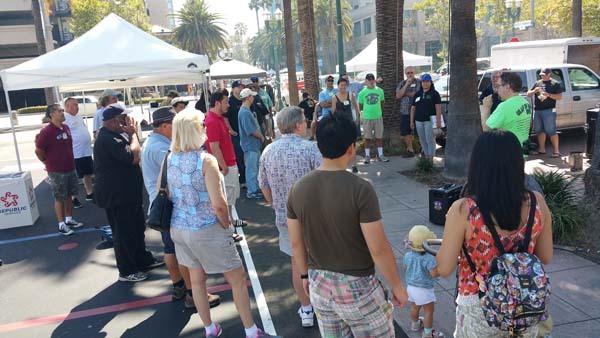 Thank you also to the Anaheim Chamber of Commerce, the Anaheim Halloween Parade for the beer garden, Steve Botkin, Ben Lobenstein, Mimi Castillo, Tom Gruenbeck, Cats with Class band, The Do Rite Collective band, our judges, our numerous volunteers and sponsors for all of their support. This small time backyarder was a big time success and it allowed net proceeds to benefit the American Cancer Society, Operation Homefront, Save The Children, and Anaheim Foundation for the Homeless charities. Loads of fun. Worth the drive. Learned a lot! Thanks Peter for coming all the way from Phoenix to assist and support our event for a good cause! About all I can say is WOW! 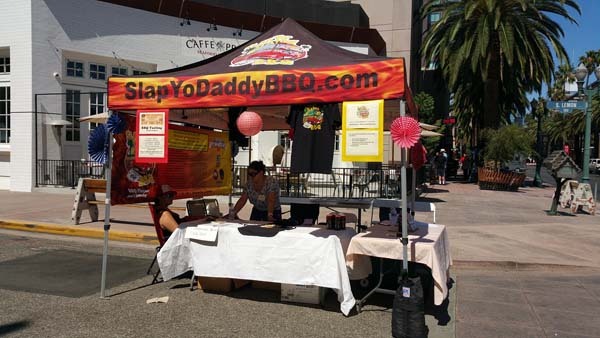 What a great thing to do for BBQ ("Spreading the Love", to quote Harry). Harry has helped me, through his appearance on TVWBB along with his Blog to raise my BBQ level several levels. Not only do I thank you, but so do my guests and family (they LOVE some BBQ(:>))! Thanks so very much Laura for your support and kind words! Live, Love, and Barbecue! This was a excellent competition I learned alot and enjoyed the professional setting. Glad to hear! 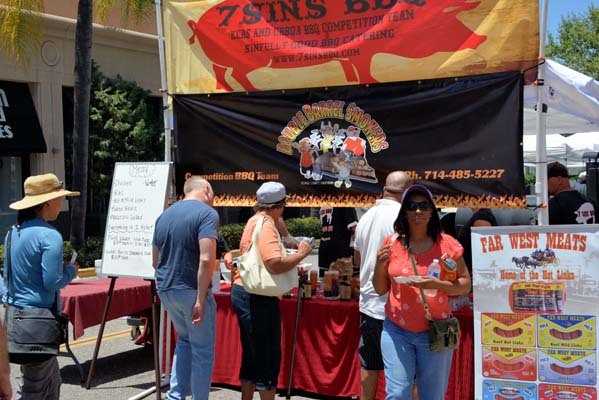 Keep spreading BBQ love with what you learned!